Freeholders recognize April as Sexual Assault Awareness Month. 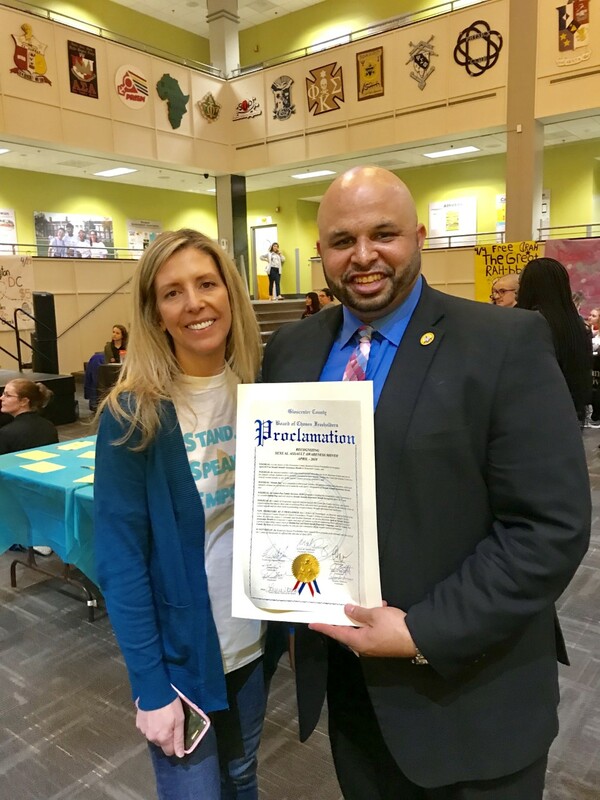 Freeholder Jim Jefferson presented a proclamation at Rowan University’s annual Take Back the Night event on April 2 to recognize April as Sexual Assault Awareness Month. The proclamation was presented to Gina Ridge of Center for Family Services, Services Empowering Rights of Victims program. SERV provides support to hundreds of survivors of sexual violence, domestic violence, and human trafficking each year. SERV advocates attended and supported the Rowan University student body by presenting during the event, answering questions and providing resources throughout the night. SERV is also promoting Denim Day throughout April to assist victims get the help they need. By pledging $5 and wearing denim on Fridays in April, members of the community can make it easier for victims of violence to access crisis intervention services including a 24/7 hotline, counseling, safe housing, and advocate accompaniments to hospitals, police stations, and the court.